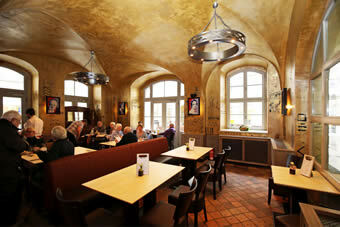 The so called Schänke is our main dining area. The Mediterranean terracotta floor and the historical arched roof create a unique atmosphere. An integrated wooden buffet presents antique flair and tradition. At least once a week it is used for our brunch on Sundays. Floor-to-ceiling windows as well as old photographs complete the biggest room of our restaurant. A terrace door leads to a spacious terrace in the historical courtyard named Barthels Hof. Meet up with friends, family or colleagues for a chitchat, a good wine and delicious food. In our good old tavern everyone feels at home. In addition, guests can use this dining area for private or corporate events. With a capacity of approximately 70 people the Schänke offers room for quite big events and is customizable. You will notice that this is the smallest but most elegant room of Gasthaus Barthels Hof. About 40 people can take a seat here. Historical details are combined with modern elements such as huge, circular ceiling lights. The wooden tables are covered with a white robe, red runners, flowers and candles. Old wooden mirrors contribute to a comfortable and classy ambience. This room is just perfect for a private, corporate or romantic dinner, e.g. our candle-light-dinner. 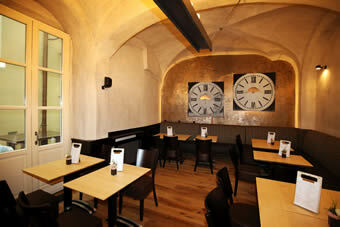 Enjoy your favorite dish in a calm and private atmosphere within the historical city center of Leipzig! 500 years ago, the vaulted cellar was already used as a small brewery. Its known as the most traditional room of our restaurant. Since that time, people have always enjoyed regional food and home-brewed beer. You will find rustic facilities, tiny niches and corners to sit in the middle of historical stonework. While you drink a local beer and enjoy some solid food you will feel transferred in former times as farmers and salesmen still traded their goods within Leipzigs city center. Up to 50 guests can enjoy the rustic atmosphere and sit at the huge traditional bar. During autumn and winter  when the Zechgewölbe is often favored  we organize private events, Christmas parties as well as business events. Let yourself be enchanted by one of Leipzig's most beautiful and historical courtyard. Take a seat and enjoy calm summer days with homemade lemonade or a glass of rhubarb juice. Surrounded by baroque buildings you will feel the spirit of history and tradition that is represented. Event manager as well as private group leaders will find additional information about our restaurant and the capacities in the category Banquet/ Events..
Take a look throughout our rooms and the courtyard of Gasthaus Barthels Hof within our online gallery an.